Supergirls need the right fuel in order to be super! Secret code of a Super Girl, Episode 4 featuring Jackie Olmstead, Aka Earth momma. Truth: What you fuel your body with supercharges you. Plant-based food nourishes more than just your mind and body, it activates your soul! As you know it’s my mission to make you super and that means helping you understand what is best for you and your body. One of the key ways to feel and look your best is by eating well. Ever since I began my journey to heal myself, which ultimately began with me healing my emotions following my self-esteem collapse, I have made it my mission to not just heal my mind but my body too and these come hand in hand. I used food to numb out pain and to comfort me, to the extent that I would eat badly and use it as a tool to be disgusted with myself. The reality was, it wasn’t ever about the food, it was about how I felt about myself deep down and the food was the tool. Slowly over the years and bit by bit, I have deconstructed my habits and finally come to a place where I have a balance with the way I eat and exercise while having a healthy and loving relationship with food. I couldn’t have done this though unless I had understood how I really felt inside. Now that I have reconciled my self-talk, my self-esteem and overall confidence, I feed my body with love and that comes in the form of plant-based food. Hands down, I haven’t felt better than when I’m eating plant-based food. My plate is made up of mostly vegetables and or salad with snacks in the form of fruit or nuts and seeds. Our teeth show that we aren’t meant to be these meat gorging species and before you say, we need meat to build muscle notice how well built a gorilla is and all they eat are plants! I toyed with vegan and found that a challenge to be 100% without ANY animal products such as cheese or my daily cuppa English Breakfast tea. However, I am passionate about revolutionising my health as well as helping the planet in any way I can and that means limiting my meat intake. After exploring what worked and what didn’t, I found that filling my plate with mostly plant-based food made me feel light in my body, bright and overall much healthier. This isn’t a shout out from my soapbox about ‘not eating meat’, in actual fact I do eat meat but I make a conscious decision very occasionally to do it and always ensure its organic and sourced it from a reputable, local farm – I’m a massive fan of Riverford farm food. If this is something you are interested in and you want to boost your superpowers, I would highly recommend giving it a go and notice how you feel when you choose meat or dairy in contrast to plant-based food. When I sit down and look at a menu at a restaurant, I ask myself, ‘How am I going to feel after I have eaten this?’ and compare it to how I want to feel. Sometimes I consciously choose to have a meat or dairy-based meal and am prepared for the consequences – bloating, poor sleep, sluggish digestion. I don’t believe that anything should be off the menu because as soon as you deny yourself something, you want it even more – it’s human nature. This is about making changes and creating a way of life that is all about balance and nourishing your mind, body, and soul. Diets don’t work because we go into that scarcity mentality and we want everything we can’t have. The most important thing that you can do if you have an unhealthy relationship with food like I did, is begin to explore how and what you are using food for; comfort, relieve boredom, numb out anger. As soon as you bring a conscious awareness to your habits, you can begin to understand them and ultimately change them. If this feels really overwhelming I have help at hand as I recently spoke to the lovely Jackie Olmstead – aka Earth momma, a plant-based wellness coach and founder of Earth momma living. Jackie set this up to teach women how they can ‘transform their kitchens and lives into a plant-based and chemical-free home and even gluten-free’. She knows and understands that when you make the commitment to this way of life, it can feel overwhelming and many don’t know where to begin. Jackie gently guides women and shows them that they can ‘heal their own bodies and minds, thus healing the entire home and all who live in it.’ She teaches the concept that your ‘body knows what to do once you listen and align in a cleaner environment. Once you, as a woman, begin to hear your own voice, then you can also know what questions to ask your health care practitioners in order to work together and make the healthiest decisions for you and your family’. What’s not to love by making some simple changes? Jackie was from a family that suffered hidden addictions and depression which eventually she played out herself. She has been sober since 1990 when she embarked on her spiritual journey to heal her demons. Despite this, she suffered ill health with celiac disease but although eating mostly organic and nutrient-rich diet, her body struggled to absorb nutrients and she was left feeling depleted and depressed. It was at this moment that she began to explore the truth behind how food is made and the origins of disease in our culture. From that moment, she made the transition to a whole food, plant-based diet in January 2016 which has consequently transformed her health and she has never looked back. Part of my mission is to help women understand how they are no longer powerless and actually it is you who holds the key to your health, not pharmaceuticals or doctors. The way that you feed and fuel your body is directly linked to the way you feel about yourself. You know those days when you feel down and out and reach for the chocolate, or are in one of those ‘I don’t give a f*ck moods and dial-up Deliveroo. Well, believe it or not, you are using food to numb and drown out those feelings that you don’t want to feel. Know that you have the power within you to heal your body and soul. Speak directly to your higher and inner self by writing in a journal with an implicit intent on having dialogues. Be loving and listen to what comes from the powerful exercise. Allow the voice(s) to come through without judgement. I teach this process and I still use it today. Learn about the basics of whole foods plant-based living. Take one step at a time to increase the amount of whole foods and clean living in your daily life. It isn’t not as hard or scary as you might think. There is so much love and teaching out there to support you. There are many online resources available. Take one step at a time to implement these changes. Join a group or hire a one-on-one coach, whichever works best for you. I host a free Plant Based Gluten Free living Facebook group or I can do one-on-one support as well. We are here to help each other! Reach out to other women who you resonate with for support! Make time for at least 15-30 min. of movement daily. Exercise in whatever form you like. Be gentle with yourself. Know that your process and actions are meant to be imperfect. Honour your feelings and keep going or rest if you need it. Align yourself with others who are doing what you want, have what you want, can help you achieve what you want. Allow others to help you whether it’s your physicians, a coach, or social media groups or a local support group. Ask lots of questions! Become active in the groups or conversations about your mission. Along these same lines, recruit your current medical team to support your goals with this. Honouring them for their expertise but also honouring your own choices will help you get what you most need. NOTE TO ALL FUTURE SUPER MUMMIES! If you want some super empowerment tools, she has taken it to the next level and not only now fuels herself with plant-based food and positive thoughts, she has also shared her knowledge with her daughter and begun this during her pregnancy! She shares, ‘One of the most powerful times of my life was when I chose to purposefully have the healthiest pregnancy and birth for my daughter. I studied and participated in the 12-week Bradley Birthing Method program (natural birthing, husband-coached) with several other couples. Talk about empowerment as a woman!!! With choosing the food I ate, exercises to strengthen my body to assist in natural birthing and creating a list of preferences to share with the doctors and nurses from educated decisions my husband (at the time) and I made, the experience was life changing. By creating a visualization and a written plan of her entire detailed birth story, it went very smoothly and absolutely affected the future of my daughter’s health and life. This experience also taught me about writing about anything that might be stressful or potentially complicated: Writing out a plan or a desired outcome does absolutely work.’ We create our realities and so it was! If you are confused with what to eat and what not to eat, I recommend Dr Mark Hyman’s recent book, ‘WTF should I eat?’ which explores all the food groups and dispels all the myths and misconceptions so that you can really get to know what is good and bad for you. Plenty of food for thought here! You have the tools to be super and transform your life. 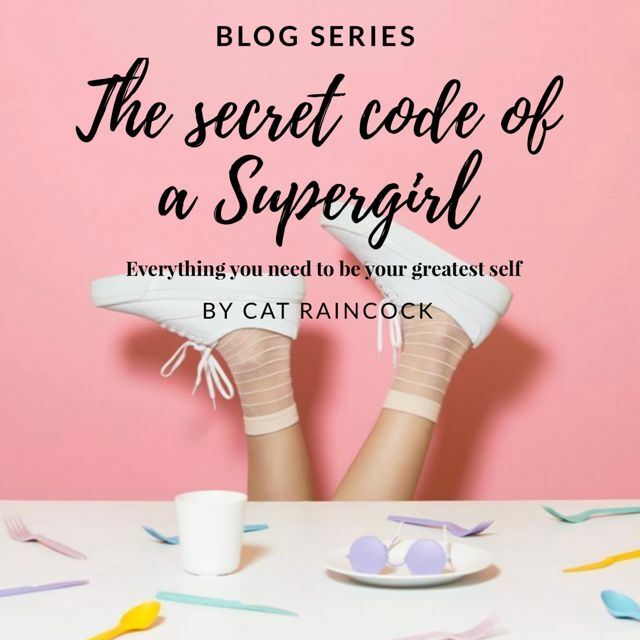 This is the secret code of a Supergirl and you’re on your way to be awesome, not just super. ‘Know thyself’. –written at the Temple of Apollo at Delphi, so very simple, but powerful words. Jackie has been kind enough to share her master list of Kitchen Essentials for a plant-based home along with a printable grocery list sheet, plus her Clean 15 produce list. And if that’s not enough, she is offering a 30-minute complimentary wellness consult on the phone, in person or on Skype to all my clients! Yes, you better believe it! So, if you’re wondering what’s really going on with the way you eat, it’s time to get underneath it and really understand what’s driving it. What feeling are you numbing out with food? When you heal this part of you, that’s when you can truly start detoxing the way fuel your body. Begin to peel away the layers, little by little, bit by bit and soon you will get to the core and live your most super life. You are on your way to being super inside and out! Now that’s exciting! !